A decent amount of knowledge of the book, a fare share of exposure to Ang Lee’s work, and every friend’s Facebook or Twitter grandiloquence about the movie- this was the baggage that we carried when we entered the movie hall to watch the Life of Pi. We indeed chatted up a lot about the movie and all our varied expectations, only to drop them all and get completely engrossed in the film within the first five minutes itself. For starters this movie is a huge ray of hope for 3-D animation, the opening song and sequence is evidence to this. For me personally 3-D had lost its charm with movies like Don 2 being released in caveman quality 3-D. In many places Ang Lee’s camera portrays places like Pondicherry in a very pristine way. And for that matter this movie is very much grounded in nature, the environment and nature’s miracles, or its processes in the purest of form. Coming to the performances, the actors in the movie have done an exceptional job. Suraj Sharma, who plays Pi for most part of the movie, has done a great job, and as a new comer is like a breath of fresh air. What deserves special mention is the fact that Suraj spent most of his screen time as Pi, who is stranded in the middle of the Pacific with wild animals and this is where his real talent shows. He has done surprisingly well given the fact that he was acting all alone before as green screen and really brings the story to life. Irrfan Khan- naam hi kaafi he, and this holds true even for this movie. The scenes where he is on screen his eyes did the talking, and when he is the off-screen narrator the timbre of his voice moves the audience along with the story. What is striking about Irrfan Khan’s character is his accent. “He (Ang Lee) told me to have a French- Canadian- Indian accent.” Irrfan Khan was quoted saying on a TV show. And that is very true; Irrfan keeps his signature, ere of mystery alive even in this quirky tongue. Tabu played her part of a typical Indian mother very well and together with Adil Hussain (playing the part of her husband) keeps the dynamics of a typical Indian household alive. Last but not the least, the animals, the movie has woven the parts of the animals so beautifully in the story that they leave a lasting impact on all. 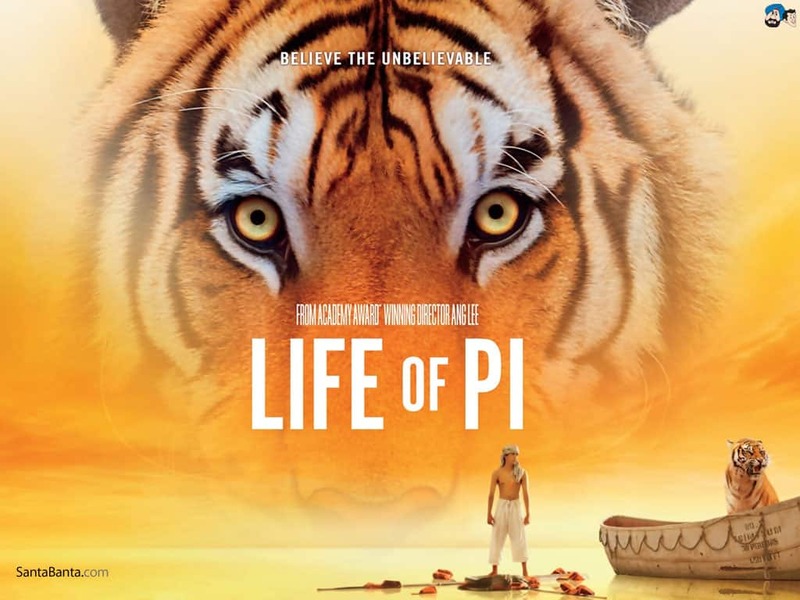 The film is doused with scenes where the animals interact with the audience, and Richard Parker- the majestic Bengal tiger takes the lead here. The audience is left pondering over the part those animals had to play that were stranded along with Pi on a lifeboat. The movie also delves into the realm of the divine and for that matter divinity is a major subject that the story uncovers. For those of you who have read the book, let me give you some good news, there are many elements in the movie that are different from the paperback. Let me also tell you to be prepared for many, many surprise scenes that Ang Lee drops like bombs on the audience. I risk sounding like a spoiler but let me say this though, there will be a lot of fireworks when you expect the waters to be still. The lasting image that the film leaves is that of the surreal cinematography, and the careful story telling that keeps everything fascinating yet close to reality so that the surreal doesn’t seem to be unreal, hats off to Ang Lee for that. The Life of Pi deserves 4 out of 5 beats!